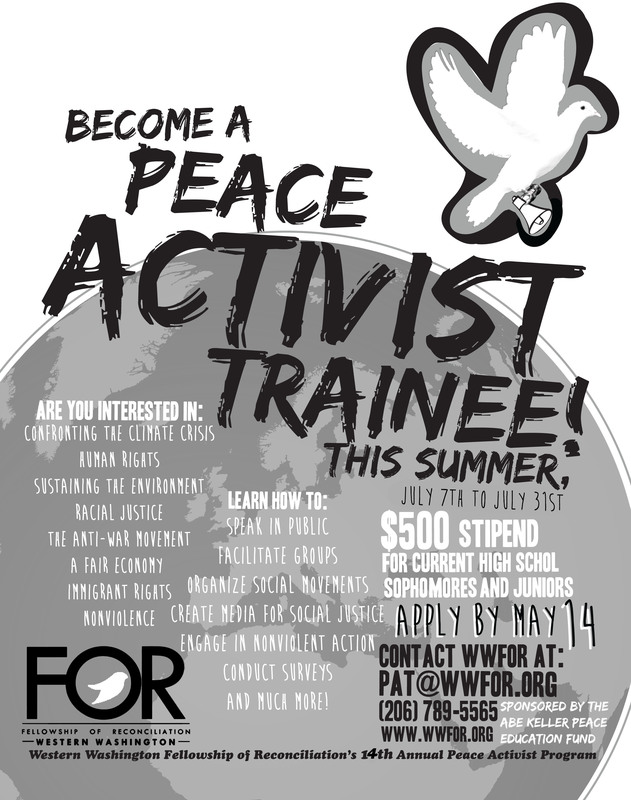 The 2014 Peace Activist Trainee (PAT) program ran Monday July 7 through Thursday July 31. This year we touched on many justice and peace issues and concerns. Because of inclement weather, the soapbox speeches at Victor Steinbrueck Park occurred during fleet day – so more “regular people” than ever before got to listen to these passionate, articulate youth. Their guerrilla theater piece (part of their overall project on the King County new juvenile detention center) surprised people in downtown Seattle, challenging assumptions and educating as they went. Their evening rally with excellent speakers (including a number of the PATs), chants, and group “privilege walk” were well-received. We ran out of the leaflet used for both parts of the day; it impressed both jaded activists and people-on-the-street. View video of guerrilla theater. As part of the month, we talked to people on the street, visited Casa Latina and Tent City, met with anti-war veterans from Coffee Strong and recruiters, went on an “inequity tour,” conducted a survey about the unaccompanied children crossing the border and met with Congressman Adam Smith’s district deputy director to discuss our findings and concerns about proposal to house the children at JBLM, the Tacoma detention center and immigration. In addition we got to meet activists working issues from the climate crisis to Gaza to racial justice, as well as building organizing skills about campaigns, facilitation, nonviolence, public speaking, and more. View the 2014 PAT exit interviews. You can view the application form as a Pdf or Word document. You can catch a glimpse of the 2013 program from the 2013 PATs In Their Own Words. And you can read about Azeb Tuji’s reflection on her summer. And you can see some photos from the program. Or see some of what the 2012 PATs did on this summary video. Or view a May 11, 2013 interview with PAT staff Ellen Finkelstein and Kaeley Pruitt-Hamm with Mike McCormick on KEXP about the program. If you have questions about the 2014 program, contact 206-789-5565 or email pat@wwfor.org. What is the PAT Program? 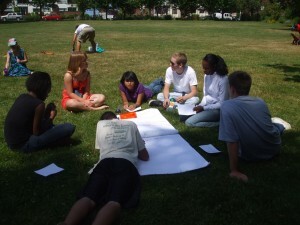 The PAT program is a paid month-long summer program for high school students who want to gain skills in organizing for peace and social justice. It’s designed to help you develop your voice to create change in your community. It is run by Western Washington Fellowship of Reconciliation (WWFOR) staff with the partnership of the Abe Keller Peace Education Fund. 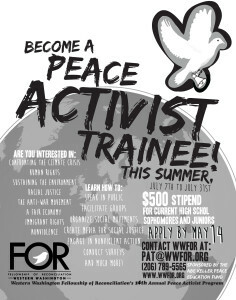 We learn about peace and justice issues, nonviolent movement building, and gain skills such as public speaking, group leadership, media development, conducting surveys, public relations, outreach, and lobbying. We meet individual activists, visit organizations, are introduced to current hot issues, and are mentored by experienced activists, public figures, and community organizers from the Seattle area and beyond. An important part of the program is when students work together to create a collective project that puts the knowledge they are gaining into action in the community. Past group projects have focused on topics such as the school-to-prison pipeline, water rights, homelessness, police accountability, racism in Seattle, the definition of terrorism, military recruitment in schools, the war in Iraq, and nonviolence. 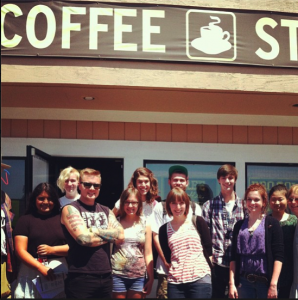 So far, the PAT program has graduated almost 100 high school students from the greater Seattle area. After returning to their schools, PAT graduates have put what they learned into practice, including raising funds for a girls’ school in Afghanistan, launching a school peace group, directing an all-day Martin Luther King Day event, helping organize a city-wide walk-out in opposition to the Iraq war, limiting the Junior ROTC in the school, raising funds for aid to Katrina victims, being a panel member at a large event on the illegality of the Iraq war, co-teaching a high school class on social change, and developing a photo petition social media campaign. The PAT program is challenging, fun, intense, and relaxed. It’s a whirlwind of learning that will leave you inspired to work – along with your new friends – to make your world a better place! This program is for students who have finished their sophomore and junior high school years from the greater Seattle area. It is for folks who have an interest and passion for peace and justice issues, and who want to learn more about how to work to change their communities. Students often have a variety of previous experiences, so don’t worry if you haven’t done much organizing before. We encourage people of all colors, creeds, abilities, sexual orientations, genders, and economic standings to apply. The 2014 program ran for four weeks, from July 7 through July 31. We met five hours per day, from 10am-3pm, four days per week, Monday to Thursday. The days are usually divided up into a morning and afternoon session, with a lunch break. We ask that trainees bring their lunch with them, as there is not enough time to go out for lunch. We will usually start and end the day at Woodland Park Presbyterian Church, at 70th and Greenwood in Seattle, where WWFOR (not affiliated with the church) rents an office. If we end the day elsewhere, we will make arrangements to return you to the office if needed. In addition, participants and staff will jointly schedule two evening events: a dinner for family and supporters and a group project event. After the summer program is over, PATs and staff get together to hang out, catch up, and attend each other’s special events. Fill out the application form posted at www.wwfor.org and send it and a letter of recommendation to pat@wwfor.org or by postal mail by May 14, 2014. We will be conducting interviews beginning May 27, 2014 with applicants. We will meet activists, participate in workshops, visit organizations, listen to people on the street, communicate with a person in power, speak in public, and create and complete a group project. We will work at the WWFOR office, on the street, and various other sites. We will cover a wide range of topics and skills, and you will have time to do your own work. A core group of adult leaders run the program: Ellen Finkelstein is the coordinator of the program. She is joined by Kaeley Pruitt-Hamm and Dante Garcia (graduates of the program) who serve as facilitators. 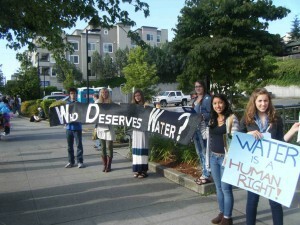 Other FOR members and other activists provide support with the office, logistics, and program. 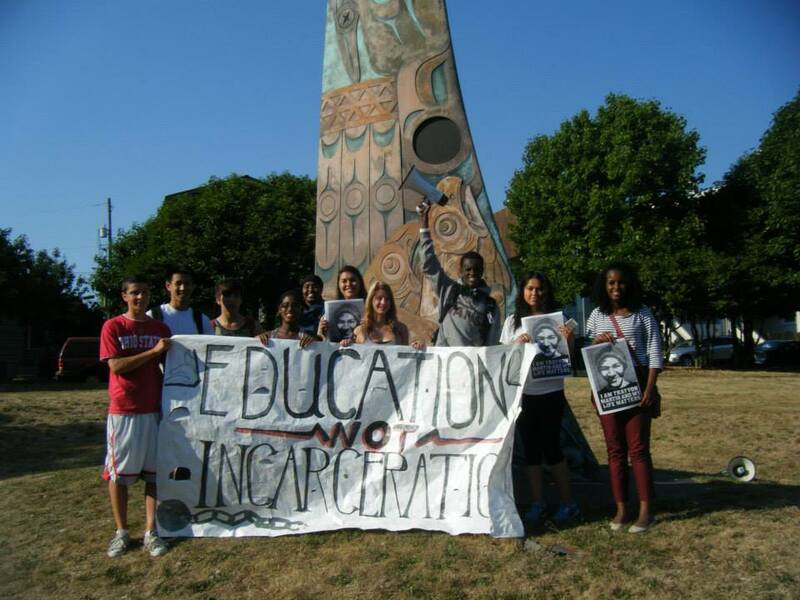 We may bring in outside speakers with specific areas of expertise and have been able to have conversations via Skype with activists outside Seattle and the U.S.
Can I get school credit? If you want to get independent study, internship, and/or service- learning credits for your high school, we can work to arrange it with you and your school. We are willing to serve as supervisors for these sorts of programs. If you are interested in doing that, please ask your school about their requirements and procedure, then talk to us! You can catch a glimpse of the 2013 program from the 2013 PATs In Their Own Words. And you can read about Azeb Tuji’s reflection on her summer. And you can see some photos from the program. The PATs did some amazing things during the course of the month. 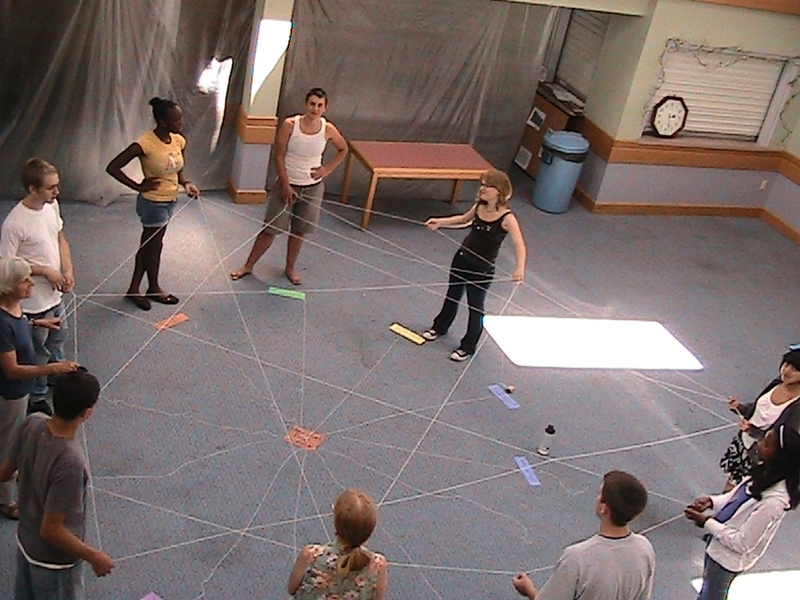 They met a number of activists working on a variety of issues and had trainings in nonviolence, racial justice, facilitation, public speaking, and other organizing skills. They spoke their truths powerfully on a soapbox outside Pike Place Market. They went on an “inequity tour” in Georgetown, South Park, and Magnolia (neighborhoods in Seattle). After an eye-opening visit to Tent City 3, they chose to conduct a survey about homelessness, and then were visible allies, attending and speaking at a Seattle City Council hearing on homeless encampments legislation. They met with King County Councilman Larry Gossett to talk about homelessness, as well as King County legislation that would restrict detention of undocumented immigrants. They spoke with Iraq War veterans (Alex Bacon & Greg Miller from Coffee Strong), followed by an appointment with a Navy recruiter, and then debriefed. The PATs attended a youth-of-color organized-and-led rally featuring spoken word outside the King County Courthouse that addressed the death of Trayvon Martin, the hunger strike at Pelican Bay prison, the criminal justice system, and its impact on youth. Motivated by that experience and information about the school to prison pipeline (among other things), their final project included a flash mob at Westlake followed by an energetic, visual march and rally (“Youth in Danger: Police Brutality and the School to Prison Pipeline”) from Garfield High School to the King County Juvenile Detention Center in the Central District. That’s the short list of all that the PATs did, and we imagine, they’ll continue to do amazing things. The 2012 PATs had a jam-packed month of activities! Catch some of what they did on this summary video. They conducted a survey on the contributors to violence, planned and executed a community event featuring spoken word and testimony from veterans, and presented the survey results to King County Councilman Larry Gossett. They visited Tent City 3 and homeless youth community PSKS, heard from speakers on racial justice, Israel and Palestine, immigrant rights, and nonviolent strategy. What are the causes of violence? What can we do to make Seattle safe? How can nonviolent strategies be effective? It was followed by discussion. Check out the a May 11, 2013 interview with Ellen Finkelstein and Kaeley Pruitt-Hamm with Mike McCormick on KEXP about the program. You also can check out a promotional video about the 2011 program.